← IS SALVATION SOMETHING WE DO, SOMETHING GOD DOES OR BOTH? The above verse of scripture is a favorite among many religious groups. One can hear it several times on Sunday morning radio programs, as well as from the pulpits of numerous groups, and it can be found in much religious literature. The verse is a favorite because, on the surface, it seemingly states that one must be baptized in order to be saved, and without baptism one is not saved. So, those who believe that water baptism is essential for salvation make it a regular habit of using Acts 2:38 as scriptural support. The problem is that Acts 2:38 isn’t the only verse in the Bible which deals with salvation. While many claim to “speak where the scriptures speak and remain silent where the scriptures are silent,” they practically ignore most of the New Testament teaching on salvation. The only verses that such false teachers quote and reference are the ones they feel they can use to promote their “water gospel.” The fact is that most of what the New Testament says about salvation doesn’t include baptism at all! (John 5:24, John 11:25-26, John 14:6, Romans 4:5, Romans 10:9-13, Eph. 2:8-9, etc. ), and the few places that do mention water baptism do not include it as part of one’s salvation. Water baptism follows salvation as one of the first steps of obedience for the new believer. In spite of this obvious truth, the cultists remain steadfast in their heresy, insisting that Acts 2:38 sets forth water baptism as a requirement for salvation. Thus, this verse of scripture has become Satan’s favorite Bible verse. In fact, many are trusting water baptism alone for the salvation of their souls! Indeed, Satan has deceived multitudes by his perversion of Acts 2:38. Rather than ignore Acts 2:38 by quoting “our favorite verses” instead, it is more appropriate to facethis popular verse of scripture and see if the cultists are right in what they claim it teaches. First, please notice that verse 38 isn’t the only verse in Acts 2. In Peter’s message, a great deal was said before verse 38 came out of his mouth. In fact, he even told his listeners how to be saved before verse 38! In Acts 2:21, Peter quotes from Joel 2 and says, “And it shall come to pass, that whosoever shall call on the name of the Lord shall be saved.” His words preceding verse 38 were so convicting that his listeners were “pricked in their heart” in verse 37. So, to use verse 38 out of its context causes a misrepresentation of God’s word. The verse does not stand alone, and, in fact, a totally different meaning is conveyed when one makes it stand alone. Another error that many make with Acts 2:38 is the error of assumption. It is assumed that the word “for” must mean “in order to get.” That is, being baptized “for” the remission of sins supposedly means to be baptized “in order to get” remission of sins. However, a closer look at the scriptures will reveal that this isn’t the case at all. Notice Luke 5:12-14: “And it came to pass, when he was in a certain city, behold a man full of leprosy: who seeing Jesus fell on his face, and besought him, saying, Lord, if thou wilt, thou canst make me clean. And he put forth his hand, and touched him, saying, I will: be thou clean. And immediately the leprosy departed from him. And he charged him to tell no man: but go, and shew thyself to the priest, and offer for thy cleansing, according as Moses commanded, for a testimony unto them.” Jesus made this man clean in verse 13, yet in the next verse, verse 14, Jesus tells him to go offer a sacrifice “for thy cleansing” as a “testimony.” Here the word “for” cannot mean “in order to get” because he had already gotten his cleansing in verse 13! It obviously meant “because of” his cleansing. If a man goes to jail “for stealing,” then he goes there “because of” the stealing that he’s already done, not “in order to get” a chance to steal again. Some like to argue that the Greek word “eis” means “in order to,” but this isn’t always the case. Jesus said in Matthew 12:41, “The men of Nineveh shall rise in judgment with this generation, and shall condemn it: because they repented at (eis) the preaching of Jonas; and, behold, a greater than Jonas is here.” The Greek word for “at” is “eis.” Does this mean that the men of Nineveh repented “in order to get” the preaching of Jonah? No, they repented “because of” the preaching of Jonah. So, even “the Greek” doesn’t demand the popular interpretation of Acts 2:38. The word “for” can be used different ways, not just one, so it is wrong to assume that it must mean “in order to get” in Acts 2:38. Another factor which is commonly ignored is the JEWISH factor. Every person in Acts 2 is a Mosaic law observing Old Testament Jew. In fact, they are all gathered together to observe a JEWISH FEAST called Pentecost (verse 1). A fair reading of the whole chapter (especially verses 4, 14, and 36) will clearly reveal that no Gentiles (non Jews) are present. Since this involves Jews, it involves a NATION (verse 36!! ), not individuals. No one asked, “What must I do to be saved?” The question asked concerned the NATION of Israel: “Men and brethren, what shall we do?” (verse 37) Not, “What shall I do,” but rather, “What shall WE do?” Acts 2 presents a NATION of people who come to realize that they have murdered their blessed Messiah and they’re asking what THEY must do. It’s a question concerning NATIONAL salvation. Isaiah 66:8 says, “. . . shall a nation be born at once? for as soon as Zion travailed, she brought forth her children.” The “nation” is Israel! Romans 11:26 says, “And so all Israel shall be saved: as it is written, There shall come out of Sion the Deliverer, and shall turn away ungodliness from Jacob.” Acts 2:38 is dealing with NATIONAL salvation. The Messianic Kingdom is still available to the Jews (until Acts 7:60 when they kill Stephen), so national salvation remains an issue until then. This is clear from what follows Acts 7. In Acts 8, an individual from Africa is saved (before baptism). 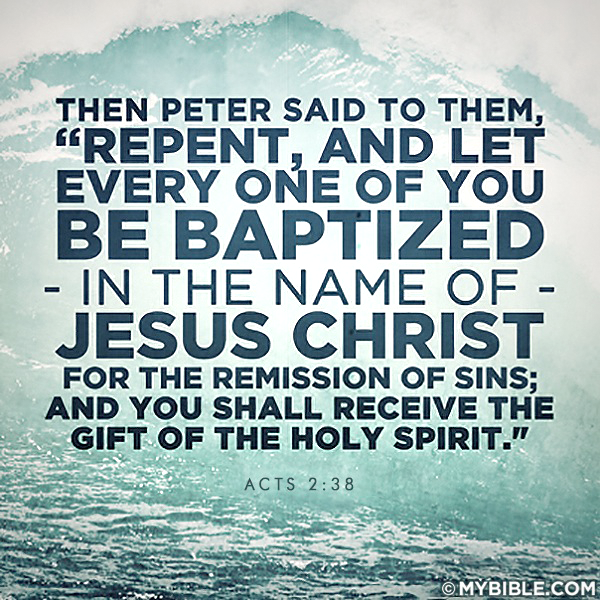 In Acts 9, an individual from Asia is saved (before baptism). In Acts 10, an individual from Europe is saved (before baptism). Why didn’t these individual conversions occur before Acts 7? Because the first seven chapter of Acts deal with Israel (1:6-8; 2:36; 3:12; 4:8-10; 5:31; 6:7-14; 7:1-60). The question of INDIVIDUAL salvation is asked and answered in Acts 16:30-31: “. . . Sirs, what must I do to be saved? And they said, Believe on the Lord Jesus Christ, and thou shalt be saved, and thy house.” Those who fail to make this distinction are guilty of violating II Timothy 2:15 where we are told to RIGHTLY DIVIDE the word of truth. The Bible says the gospel is to go to the Jew FIRST (Rom. 1:16), so they are the FIRST to receive the gospel in the book of Acts (chapter 2), but they are not the last to receive it. Acts doesn’t end with chapter 2, so we should be cautious of anyone who develops their doctrine in Acts 2 while practically ignoring the next 26 chapters! If God didn’t stop in Acts 2, then why does anyone else? Could it be that the later chapters in Acts contain information which the cultists want hidden from us? Could it be that there are other scriptures in Acts which do not agree with the wording of Acts 2:38? Could it be that Peter himself, the one preaching in Acts 2:38, says something different when speaking to individual Gentiles like you and me? One only has to read Acts chapter 10 to get the answer. Peter is preaching again in Acts 10, except only to individual Gentiles, and something very interesting occurs. In Acts 2:38, the Holy Ghost was promised to be given to the converts AFTER they were baptized, yet in Acts 10:44 the Holy Ghost falls upon the Gentiles BEFORE they are baptized! Now, Paul tells us in Romans 8:9, ” . . .if any man have not the Spirit of Christ, he is none of his.” Having God’s Spirit is synonymous with belonging to God or being saved (John 3:6-8), so the Gentiles in Acts 10 were saved BEFORE they were baptized in water. Why don’t the Acts 2:38 cultists ever point this out? Answer: It destroys their perverted doctrine that water baptism is essential for salvation. The fact is that Acts 2:38 is NOT the “model” plan of salvation, nor are any of the other “water verses” which the cultists use. Only by taking such verses out of their context can one teach such heresy. All of the Bible is true, not just the favorite “proof texts” of the cults. Baptism saves no one. It only serves as a testimonial picture of the death, the burial, and the resurrection of Jesus Christ AFTER one has believed on Christ (Acts 8:36-38). Paul said in I Corinthians 1:17 that “. . . Christ sent me not to baptize, but to preach the gospel: not with wisdom of words, lest the cross of Christ should be made of none effect.” This “gospel” is defined by Paul in I Corinthians 15:1-4, and it does NOT include water baptism. The dying thief was not baptized, yet Jesus saved him (Luke 23:42-43), and John wrote that we are washed in the BLOOD of Christ (Rev. 1:5), not in the water. In fact, the saints in Heaven claim to have gotten there by the blood of Jesus (Rev. 5:9), not by water. By faith in the blood of Jesus Christ one is saved (Rom. 3:25). Water baptism only follows this faith as an outward step of obedience. Friend, if you have fallen for the water gospel, why not repent of your sin and trust Jesus Christ alone? Acts 10:43 says, “To him give all the prophets witness, that through his name whosoever believeth in him shall receive remission of sins.” Why not believe on Christ 100% right now and quit trusting something you DO for salvation? “Therefore being justified by faith, we have peace with God through our Lord Jesus Christ.” (Rom. 5:1) Ephesians 2:8-9 says, “For by grace are ye saved through faith; and that not of yourselves: it is the gift of God: Not of works, lest any man should boast.” Romans 10:9-13 says,”That if thou shalt confess with thy mouth the Lord Jesus, and shalt believe in thine heart that God hath raised him from the dead, thou shalt be saved. For with the heart man believeth unto righteousness; and with the mouth confession is made unto salvation. For the scripture saith, Whosoever believeth on him shall not be ashamed. For there is no difference between the Jew and the Greek: for the same Lord over all is rich unto all that call upon him. For whosoever shall call upon the name of the Lord shall be saved.” Why not right now? Posted on September 14, 2015, in Baptism Prooftext, Book of Acts and tagged acts 2:38, acts 2:38 and baptism, acts 2:38 church of christ, baptism prooftext, church of christ, satans favorite bible verse. Bookmark the permalink. 1 Comment. Thank you. This is very thought provoking. I’ve enjoyed this point of view of the scriptures. Imho, the first word “Repent” says it all. I see no water doctrine. However,my view is one backed by all other divine truth of the Holy Bible. Jesus told the man after healing him, “Go, and sin no more.” Same as this verse says “repent”. I do get how if read out of context the verse –and any writing–can be misconstrued. The following site answers a 30 minute hard-line Church of Christ video asking Why Are There So Many Churches to wrongfully say there are 38 thousand churches so therefore the Church of Christ must be the "One True Church"
This site was made to stand against the hard-line Church of Christ churches who say they are the one true Church, the only true Christians and deny Salvation by Grace through Faith alone. I am calling on believing Christians in every denomination to withstand the hard-line Church of Christ false gospel and to minister to them their still present need for salvation in hopes they will get saved and leave this cultic portion of the Church of Christ denom -ination or stay within to be change agents of reform. I am especially calling on our orthodox brothers and sisters within the Church of Christ to partake in this honorable endeavor. Is the Church of Christ a Denomination? CHURCH OF CHRIST: What about James 2:24 and ‘not justified by faith only’? IS SALVATION SOMETHING WE DO, SOMETHING GOD DOES OR BOTH? ARE THERE DIVISIONS WITHIN THE “CHURCH OF CHRIST”? DOES REPENTANCE MEAN TURNING FROM SIN? Does Mark 16:16 teach Baptism is required for Salvation? Do Christians get the Holy Spirit when Baptized?